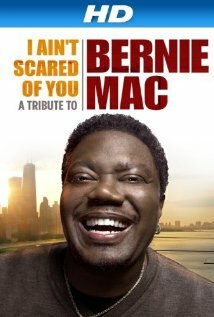 Buy or Rent I Ain't Scared of You: A Tribute to Bernie Mac (2011) Movie DVD & BluRay Online! Movie Plot: I AIN’T SCARED OF YOU is a documentary tribute to Bernie Mac (1957-2008). From his stand-up in underground Chicago comedy clubs to the Big Screen in Hollywood, Bernie Mac’s sharp tongue and heart of gold resonated with millions of fans throughout his career.This film revisits much of his work through exclusive recordings of early stand-up, featured scenes from his film and TV appearances, and interviews with his co-stars, including Samuel L. Jackson, Cameron Diaz, Chris Rock, and many more. Testimonials from friends and family offer colorful anecdotes about Bernie Mac, from his practical jokes to his strong appreciation for manicures, and paint a vivid picture of who he was as an actor-comedian, husband, father, and friend.